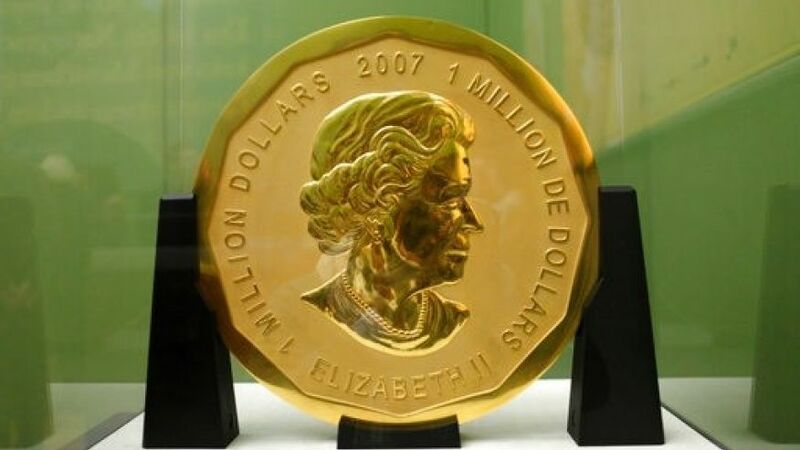 A massive gold coin worth millions of dollars, which is listed in the Guinness Book of Records for its purity of 999.99/1000 gold vanished from a museum in the middle of the night, police in Germany announced Monday, saying a group of thieves stole the 221-pound currency before police could arrive, according to the Bode Museum in Berlin, which housed the coin. The daring thieves allegedly snuck in through a window around 3:30 a.m. Monday, broke into a cabinet holding the "Big Maple Leaf" coin, stole the coin and escaped, police spokesman Stefen Petersen said. While Police searched the area, they found a ladder by nearby train tracks. 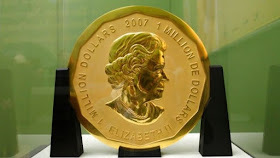 The 1.18-inch-thick coin, with a diameter of 20.9 inches, has a face value of 1 million Canadian dollars, or $750,000. By weight alone, however, it would be worth almost $4.5 million at market prices. Petersen would not comment on whether authorities had surveillance video of the crime, but said police assume more than one person was involved because of the weight of the coin. The coin has a portrait of Queen Elizabeth II on one side and maple leaves on the other. It was produced in limited quantities by the Royal Canadian Mint to promote a new line of its Gold Maple Leaf bullion coins in 2007. It has been on display at the Bode Museum, on Berlin's Museum Island, since December 2010. Berlin museums spokesman Markus Farr said the coin is on loan from a private collection, but would not elaborate. Detectives specialized in art-related crimes are investigating the theft.